Batman's arch nemesis and most heinous villain, the Joker, joins the Variant Play Arts Kai line with this design by Tetsuya Nomura. This Joker is essentially a phantom, able to transform at his will, thanks to an arsenal of accessories. 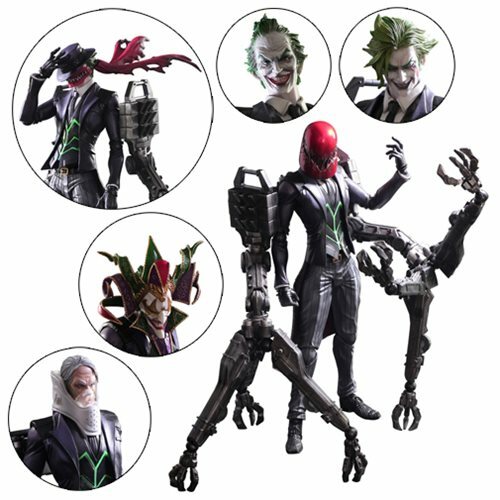 The DC Comics Joker Variant Play Arts Kai Action Figure includes 7x interchangeable faces, enabling a variety of transfigurations, as well as a heavy machinery-like power arm apparatus that can be transformed into a wheelchair. This figure comes packed with special features to reproduce the Joker's signature personality of sheer madness. A true work of fine sculpting from its overall form down to its facial wrinkles, the figure also utilizes various textures in its paintwork: his blond hair dyed green, his white face with only a hint of blood to its complexion. These paint applications exhibited throughout the figure help situate where and when this Joker is, as his various accessories hint at different times and places in his wicked life. This package fully expresses the dark allure of the infamous and singular villain, the Joker. The figure includes display stand and measures 11 1/4-inches tall x 4-inches wide x 3 1/5-inches long. The Power Arms measure 12-inches tall x 9-inches wide x 5 1/2-inches long. The DC Comics Joker Variant Play Arts Kai Action Figure comes packaged in a window box. Ages 15 and up.